Mr Monkey likes watching steam trains, but he seldom gets the chance to watch one go past at speed, so he was delighted to hear about the Buxton Spa Express. Two locomotives, LMS Class 5MT 4-6-0 no 44871 and LMS Jubilee Class 6P 4-6-0 no 45690 Leander, were going to pull a rake of carriages from Lancaster via Stockport to Buxton, and back again via Sheffield. 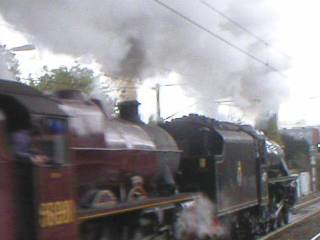 On the way to Buxton they couldn't avoid steaming through Woodsmoor, the station nearest to Mr Monkey's house. 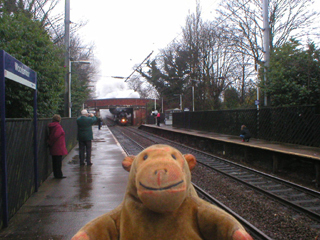 On Saturday morning Mr Monkey's humans took him to Woodsmoor station, where he found a number of people waiting for a train that wasn't going to stop. After a short wait Mr Monkey noticed a cloud of smoke with a single light in the middle in the distance, about the same time as a small child shouted "It's coming!". Moments later the smoke billowed around the bridge over the railway and the train rushed into the station. It seemed to Mr Monkey that one moment the train was under the bridge, the next it was level with him, and the following second it had rushed past. He didn't even have time to check whether the two locomotives had domed or undomed boilers (the earliest built in each class had domeless boilers) or to admire the Walschaerts valvegearing in action. He did notice that 44871, which was designed to haul freight or passenger trains, was painted black while 5690, a locomotive for passenger trains, was restored in LMS Crimson Lake. 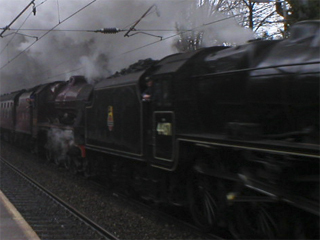 Apparently the LMS didn't approve of freight being hauled by anything other than a black engine. For the same reason very few of the Stanier Class 5 locomotives were given names by the LMS or British Rail; some have been given names after restoration. 44871 sometimes carries the Lancashire Fusilier nameplate, but it seems to share it with other Class 5s. 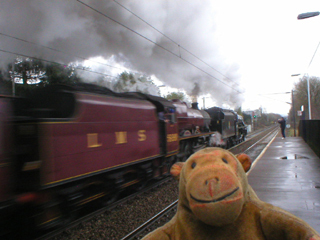 As the train rushed past Mr Monkey was so excited he completely forgot to count the number of carriages or to wave to the passengers. Smoke and soot drifted down onto the platform, bringing a lovely smell of hot steam engine, and all the children (and Mr Rik and Miss Carol) burst out laughing with joy. 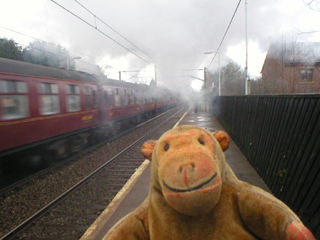 Mr Monkey scampered home, and wondered how he could arrange for more steam trains to travel via Woodsmoor.